A radar tracker is a component of a radar system, or an associated command and control (C2) system, that associates consecutive radar observations of the same target into tracks. It is particularly useful when the radar system is reporting data from several different targets or when it is necessary to combine the data from several different radars or other sensors (Wikepedia). Rationalizing Away Torture - Post-hoc rationalizations. Most of the rationalizations are of this sort, but it is included as a separate item. Basically a person is selected for torture and surveillance for whatever real reason is involved -- classified work, they are presumed subversive, they are a random experimental subject, etc. -- and then one objective of the surveillance is to come up with plausible lies about why the surveillance was begun in the first place. Pretend it is a battle between equals. Act like this is some struggle between equals, a sporting event, or even a war between two armies. Never express the reality that this is a military and intelligence attack against civilians in their homes using advanced weaponry. Demonize the victims. Pretend the victims were terrible people, who deserve what they got, and from whom the public needs to be protected. Portray domestic repression as a ``good'' sort of government vigilante action. Choose one or two victims in particular to smear. An individual cannot begin to counter a huge, behind-the-scenes smear campaign -- especially when coupled with torture -- and all the other victims will be smeared by association. Spread the blood around.The more people who can be made to take part in the crimes, the more support there is for covering them up and continuing them. Spread around the ``spoils'' of the torture. Give foreign governments and intelligence agencies some of the data and technology. Encourage the general public to participate in the harassment and torture of the victims. Appeal to the status quo. Point to how things are now. Claim that surely things would be worse if the secret atrocities had not been committed. Present some ludicrous and dubious scenarios that ``might have happened'' if the Bill of Rights had stood in the way. (The same sort of approach can be taken to show why the secret crimes cannot possibly be exposed...) The victims are only in it for the money. This absurd claim can aid in turning the public against the victims, and can even sow dissension among the victims. People are always suspicious of their purse-strings, and many are just greedy. This claim ignores the fact the most victims first want the torture to stop, and then want to see some sort of justice done. With the facts out, any claims for compensation can be rationally considered in the open. (Calling compensation for years of torture and abuse ``welfare'' is another way to belittle the victims.) It's not really that bad. The current American-style system of political imprisonment and harassment has evolved precisely to evoke that sort of reaction from Americans. As such, it is in many ways a reflection of our society. The system, at the same time, has also evolved to maximize the trauma and terror experienced by the victims. It really is that bad. Victims have to live under constant surveillance for 24 hours a day. They never know when they might be killed or have their brains fried into retardation. They cannot trust their own thoughts because their minds have been repeatedly violated. It is like being a chimpanzee in an aversive conditioning lab with an electrode in the brain. This is carried out in the context of purposely induced trauma and human social ridicule. Denying the Problem - The victims are crazy, the weapons do not exist. The standard lines. Repeat every step of the way. Put the burden of proof on the victim to explain all the technology developed in secret, black projects, and to explain exactly how the effects they experience each day are being caused. Use techniques that mimic mental illness and counter every claim of harassment with a dismissive ``paranoid schizophrenia.'' If some weapons are shown to exist, claim that the government never built any such weapons. If the government is shown to possess such weapons, claim that they would never, ever use them in the way that has been alleged. Silence the whistleblowers. Harass them. Destroy their careers. Threaten their families. Make them the next victims. "Chomskyize'' the whistleblowers. If someone cannot be intimidated, if they are too well-known, and if their careers cannot be completely ruined, ignore them. That is, actively ignore them. If too many of their facts and analyses cannot be refuted, then they are left out of the debate. Everything proceeds as if the person had never said anything. Claim, ``the system works.'' Repeat this again and again to make it more true. Sure there are some problems, but the system is working. You just need to follow channels, hire lawyers, and lobby for your cause (even if that cause is stopping the torture of American citizens by their government). Some of these things are worth doing, but not because the system works. The system only works to maintain the status quo. In intelligence matters, even more than others, the system is corrupt to the point where it is simply evil. Intelligence agencies routinely lie, even to Congress, which may or may not be aware of it. Manipulating and Turning Away From Individual Victims - Straightforward harassment. Death threats, threats against family and friends, surveillance, ridicule, attempts to demean, rumormongering. Attacks with secret weapons inside the home, harassment on the street. Psychological warfare attacks, especially with feedback from surveillance. This is a chapter in itself. Aww, poor baby. You went and got yourself tortured. You must have done something to deserve it. This really fits in with the demeaning aspects above, but I've put it here because it illustrates an attitude that extends beyond just the harassers. Call the victim naive. Imply that the harassment is normal, and that the victim should have known that all along. ``The natural order of things'' and other such supremacist crap. Everybody knows -- but at the same time it is not happening at all and the victim is crazy. If only you hadn't done that! Imply that help is on the way, and that you have the power to aid the victim. Build up the sense that help is just around the corner. Watch the victim, and when they do something you want to train them out of, cry, ``If only you hadn't done that!'' That is, no help will be forthcoming, and now it is the victim's fault. This works well with good cop/bad cop routines. It also works well in conjunction with other harassment. If the victim is really desperate, traumatized, and in fear for their life it can work over and over again. 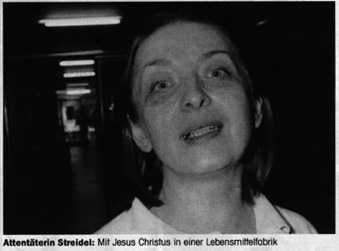 Here's the Strange Case of Adelheid Streidel. This is the story of another Psychological Torture victim whose tale smacks of political assassination. This victim's life was used to justify tighter security. Sought Publicity, Says Woman Who Stabbed German Candidate - "Social Democrat Lafontaine is recovering, vows to carry on his campaign to unseat Kohl." by Tamara Jones (Los Angeles Times April 27, 1990 A6) - Cologne, West Germany - A woman who calmly plunged a butcher knife into the throat of one of West Germany's most popular politicians told police Thursday that she did it for the publicity. Recovering from a wound that narrowly missed a major artery, a weak but cheerful Oskar Lafontaine told Social Democratic Party leaders from his hospital bed that he will carry on his campaign to unseat conservative Chancellor Helmut Kohl despite Wednesday night's assassination attempt at a packed rally here. Adelheid Streidel, a 42-year-old doctor's assistant with a history of mental illness, was arrested at the scene. Police said she was transferred to a psychiatric clinic Thursday for evaluation. Prosecutors were awaiting results of her psychiatric evaluation before deciding whether to press charges. "I wanted to kill Mr. Lafontaine so I would have to go before the courts and it would be in all the newspapers," investigators quoted her as saying. Police spokesman Reinhard Fischer said the woman described the attack as "a private political decision." "I wanted to send a message," he quoted her as telling interrogators. "There are human factories and underground operating rooms in Europe where citizens are reconstructed physically and mentally. "This takes place with the approval of politicians." Police said Streidel had no known links to terrorist groups. Investigators said she had decided last Christmas to kill a politician and that she had called Kohl's Christian Democratic Party as well as the Social Democrats to find out when and where prominent politicians would be holding public rallies. On Wednesday, clutching two bouquets of flowers, she took a cab to the rally where Lafontaine was appearing, reportedly asking the driver en route if he knew the address of Foreign Minister Hans-Dietrich Genscher. Once at the rally, Streidel sat in the second row. Television cameras scanning the audience showed her smiling broadly with a calm expression on her face. Police said she tried a couple of times without success to make it past ushers up to the stage after the speeches, then finally persuaded a guard she merely wanted to present the politicians with the flowers and get autographs. "I would like to give you some flowers because I am such a great admirer of yours," she was quoted as telling Lafontaine. She held out a poetry book and asked for Lafontaine's autograph; as he bent to sign it, she pulled out a butcher knife and plunged it into his neck, police said. Lafonlaine, 46, collapsed in a pool of blood as pandemonium broke out and security guards overpowered the still-smiling assailant. The attack, one of the worst on a West German politician in the postwar era, has raised serious questions about campaign security. Lafontaine, known for his acid tongue and brash style, apparently was singled out only at the last minute. Police said Streidel told investigators that she wanted to kill either Lafontaine or another party leader sharing the stage, Johannes Rau, premier of the state of North Rhine-Westphalia. Those of you who collect information on the government's psychiatric torture research can make copies of related reports and forward them directly to Ms. Cribbs' attorney. Those of you who have an interest in bringing the real government criminals to justice can write letters in support of her appeal. Let's see if we can get this other victim the intensive medical treatment that she needs. It does not matter that Cribbs' attorney will receive duplicate copies of various documents .... bulk counts. It does not matter that you can't send any documents...your voice counts. It's time to break the silence. Woman to Serve 30 Years to Life for Brutal Killing of Husband in 1994 by Anna Cekola (Times Staff Writer Los Angeles Times March 30, 1996 A-21) - Santa Ana - A woman convicted of handcuffing her fourth husband to a bed and shooting him was sentenced Friday to 30 years to life in prison as relatives of the slain Fish and Game official pleaded that she never have a chance to hurt another family. Ardith Cribbs, 39, appeared shaken at times as the family of Gordon Cribbs said they were horrified and haunted by thoughts of his final, helpless moments as the woman he loved shot him in the legs, groin, back and head. "No doubt he pleaded for mercy, but what mercy did he receive? None," said Harold Cribbs, the victim's eldest brother. "She was just so evil," sobbed the victim's daughter, Kendra. "She'll never know how many lives she affected, and how terribly she did it." Superior Court Judge Francisco P. Briseno, in handing down the maximum sentence, called the 1994 murder "brutal" and "completely unwarranted." Ardith Cribbs, a former prostitute with a history of mental problems, pleaded not guilty by reason of insanity, but a jury last month rejected that defense and decided the Huntington Beach woman was sane when she killed her husband. The same jury also convicted her of first-degree murder. Cribbs did not say anything to the judge Friday, but she recently told probation officials she never intended to kill her husband and believes she must have been insane to carry out such an act. She also said that she was angry her husband, a 49-year-old patrol chief for the state Department of Fish and Game, had been portrayed as perfect during the trial, according to a pre-sentencing report by the county Probation Department. Family members said they are perhaps most troubled by prosecution evidence that she never loved her husband and wanted him dead. "We took her into our family," Harold Cribbs said. "All this was shattered as I sat here in this courtroom and listened to the evidence presented. We found she was a cold, calculating, unprincipled individual who had no trouble Iying to get where she needed to go." Harold Cribbs, a former Fish and Game official like his brother, said he hasn't been able to tell his 82-year-old mother just how her son died. "If she knew exactly how it happened, it would kill her," he said. Gordon Cribbs was found dead Aug. 10, 1994, in the Huntington Beach home he shared with his wife of three years. Two acquaintances who found his body also found Ardith Cribbs unconscious in a bathroom from a drug overdose. Police found the gun used in the shooting on a kitchen counter, along with an apparent suicide note written by Ardith Cribbs in which she apologized and asked for forgiveness. Deputy Dist. Atty. Carolyn Kirkwood contended during trial that Cribbs might have mental problems, but knew what she was doing when she repeatedly shot her husband. The prosecutor said a mixture of anger and greed may have motivated Cribbs, who stood to inherit her husband's home. Here's the Strange Case of James Brady. No...not that James Brady. Another James Brady. This is the story of a Psychological Torture victim whose name is, coincidentally, the same as that of the other James Brady. This James Brady's life was also, not so coincidentally, used to justify gun control. The James Brady you're thinking of was shot in the Ronald Reagan assassination attempt. John Hinkley, Jr., good buddy of George Bush and family, after having been released from a Federal Mental Institution and, reportedly, being photographed at a Nazi rally with one of the Bush boys, shot that James Brady. Shooting Stirs a Furor Over Policies in Georgia (by Lee May and Edith Stanley, Los Angeles Times April 26, 1990 A21) - Atlanta - A shooting spree by a former mental patient in which one person was killed and four wounded touched off a furor Wednesday in Georgia over mental health policy and gun control. James Calvin Brady, the suspect in the Tuesday shootings at a suburban shopping mall, had in his pocket a form saying he was released Monday from a state mental hospital where he was treated for showing homicidal tendencies. The question of why he was released after only 10 days of treatment reverberated on radio talk shows, in the subway and on the streets Wednesday. State officials say they were only following criteria for such releases. "There are fairly rigid constraints" on holding patients against their will, said John Watson, deputy superintendent of the Georgia Regional Hospital, where Brady was held. Overcrowding was not a problem at the hospital, officials said, implying that Brady was released because he was judged to be no longer a threat to himself or others. Brady was back in a state mental institution Wednesday, after De Kalb County jail officials determined they could not care for him properly. 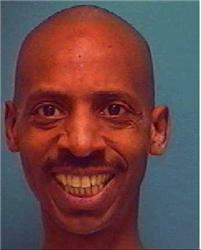 He was taken to Central State Hospital in Milledgeville, Ga., for evaluation. Authorities said they still expect him to stand trial in the shootings. Jim Ledbetter, commissioner of the state Department of Human Resources, said Georgia's eight mental hospitals treat 20,000 patients a year, almost 80% of whom are involuntary patients like Brady. He said the shooting was the first such incident he recalls involving a former mental patient. According to Webster's New Collegiate Dictionary, the word lucid means “suffused with light; luminous; translucent...” Astonishing and undeniable evidence exists of an incredible, new universal human control system. Officially called L.U.C.I.D., it is a grotesque system of universal slavery which - even as you read this - is being implemented by federal and international intelligence police agencies. This computerized I.D. card - to be followed eventually by an implanted chip - is an electronic straitjacket that allows the New World Order's Gestapo to track and link every man, woman, and child on planet earth. Our activities are going to be monitored 24 hours a day, seven days a week, by federal Gestapo agencies - the FBI, IRS, BATF, CIA, DIA, DEA, NSA, NRO, FINCEN, the U.S. Treasury Service, the Department of Justice, and countless other police agencies. Stunning Disclosures - Only a few of the authorities in the field of biochips and implantable devices are joining me in running up the red flag about the mind control abuse potential of this technology. Most see implantable biochips as offering a marvelous and bright future for mankind. One such expert is G. Harry Stine. 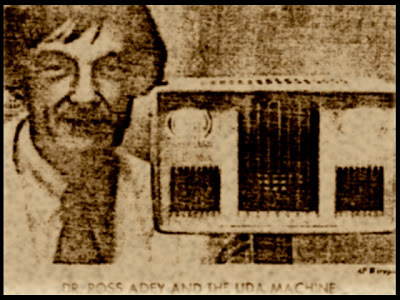 In his book, The Silicon Gods, Stine foresaw a near future in which men could become like gods through the use of “intelligence amplifiers” implanted in the brains. Stine wrote that, very soon, intelligence amplifiers - tiny microchip devices either implanted in humans or capable of being temporarily connected to the human brain and sensory channels - will actually allow others to “get inside a person's head.” With such devices, we will possess the astonishing ability to hear the thoughts of others." Researchers have made rapid progress to bring this to reality. An eye-opening article in Science News reported that, “New electronic techniques are being developed to eavesdrop on the brain.” According to Science News, “The techniques, under study at the University of Michigan at Ann Arbor, in AT&T labs, and elsewhere, will allow outsiders to directs a person's brain cell conversations and talk directly to the individual's brain neurons. The article also said that current research centers on the eventual employment of integrated circuit chips that can either be implanted in the brain or overlaid with brain cells.” Will the L.U.C.I.D. net someday integrate this brain control technology into its global system? Even Stine, an optimist who believes that man will not allow the abuse of these capabilites, nevertheless warns: It also contains the seeds of unimaginable evil: the actual control of human minds by other humans. Not brainwashing. Not propaganda. Not any of the ancient and well-proven means of mentally or physically imposing one person's will by police action or torture. But the actual control of the human mind. Paranoid Thinking...or Reality? - Whatever technology man can invent, the Illuminati, in the last days, will use to control and either pacify or induce fear and terror in the masses. Some may call this paranoid thinking, but the wise know it as truth. As Media Bypass, a patriotic magazine, in an article entitled, “A Chip in Your Shoulder,” stated: Implant technology is not new. Although routinely ridiculed as a paranoid delusion, the Food and Drug Administration (FDA) has mandated electronic biochip implants into humans receiving pacemakers, prosthetic devices, and even breast implants since 1994. Literally thousands of Americans now carry these microdevices under their skin...Endangered animals and livestock also carry implants to track their migration of feeding habits. Interestingly, Timothy McVeigh, alleged bomber of the federal building in Oklahoma City, claimed that, while on active duty, the U.S. Army implanted a “tracking device” in his body. Was it this device which allowed the federal Gestapo cops to track down and locate McVeigh so soon after the bombing incident? Did the feds know where the suspected terrorist was at all times, courtesy of an overflying satellite - even before the bomb went off? Dr. Rod Lewis, publisher of C.E. Chronicles and head of a scientific study network in Houston, Texas, apparently mindful of this distinct possibility, noted: “There are no reports that McVeigh had any type of mental illness, disorder, or displayed any clinical symptoms of paranoid or delusional thinking.” Lewis futher raises eyebrows when he writes: What makes this case even more interesting is that D. Louis J. West, M.D., Professor of Psychiatry at UCLA, was interviewed on CNN the day after the bombing as an expert on “terrorist behavior.” Dr. West was the examining psychiatrist of Jack Ruby, assassin of Lee Harvey Oswald. He is also well known for his work in mind control in the 1960s and was a proponent of the use of biochip implantation to control violence. It has been rumored that much of Dr. West's research was funded by the Central Intelligence Agency. It is now known that Dr. West will be the consulting psychiatrist for the case and that all of Mr. McVeigh's military and medical records have been closed. Dr. West's name has been mentioned in a number of books about mind control including Jim Keith's A Casebook on Alternative 3, Walter Bowart's Operation Mind Control, and Martin Cannon's white paper, "The Controllers." Is it just coincidence that of all the psychiatrists in the United States, Dr. West would be selected to oversee the psychiatric evaluation of Mr. McVeigh? It seems that in the eyes of the government there was good reason - something that they did not want others to see perhaps? Silicon Octopus: Men Trapped Inside Electronic Cages - There is a plan to bring America into a New World Order,” writes Dwight Kinman in his insight-filled book, The World's Last Dictator. In reality, Kinman says, “The New World Order is the secret code phrase for a one world government.” This plan, Kinman adds, “is gathering momentum and accelerating with the speed of a runaway freight train:” Behind this plan are powerful, global, megaforces that are on an inexorable, relentless drive to establish, on planet earth, a super world government by the year A.D. 2000. They believe they have it almost within their grasp, and they are about to make a dash to the finish line. I am convinced by a mountain of evidence that Dwight Kinman is correct. The hidden plan for a super world government is in its final stages of completion. But, if so, why haven't the media reported it? Why are the American people so abominably ignorant and so painfully oblivious to what is happening? Why are they not more alarmed about the loss of personal privacy and freedom that is resulting from the continuing growth of Big Brother's technological chains? Is it not only the L.U.C.I.D. net, its remote sensors, its Universal Biometrics Card, and its future implantable biochip we are talking about. As invasive as this system is, Big Brother has many more tools in the realm of Black Science. In his eye-opening book, Black is Beautiful, Dr. Peter Ruckman lists some of the startling, advanced technologies being experimented with: This new bunch of barbarians - just as pagan as any B.C. Aztec witch doctor - are engrossed in: ELF zapped genes, single phase, speeding DNA transcription, microwave radiation, reciprocal and effective mass tensor points, micro-pyramid structures in “Cu Metal Flakes,” ionic crystalline structures, transduction of theta waves, videodrome signals, the earth's Power Grid Vortex, Fluxon, Spinors, Scalars, ULF effects on biosystems, and phase relationships in the wave of motions of radio frequencies. Why are the vast majority of Americans unaware of the electronic cages prepared for them and of the looming loss of our precious heritage of constitutional rights? Jeffrey Baker, in Cheque Mate: The Game of Princes, writes: America has been dumbed, dulled and tranquilized into a state of semi-conscious existence. We have become the "Stepford Nation." We look without seeing. We listen without hearing. We experience without feeling. To paraphrase a recent commercial of the past - “I've fallen and I don't want to get up.” Dr. Peter Ruckman...has also identified the controlled media as a bottleneck preventing Americans from receiving accurate and truthful information. He calls it a “News Media Curtain:” There was a “Purple Curtain” between the Vatican and Rome from A.D. 500 to 1996. There was an “Iron Curtain” over Russia from 1945 to 1992, and there still is a “Bamboo Curtain” over China...But, in 1996, there is a “News Media Curtain” that has prevented 200,000,000 to 300,000,000 American citizens from finding out what is actually going on under their noses...What did Life, Time, Look, Newsweek, USA Today, CBS, NBC, ABC, CNN, US News and World Report, Fortune, Omni, and the National Geographic magazine (plus 500 "dailies") follow, while they professed to be reporting the “news”"? It had to be lethal, for sixty years of reporting failed to mention one time the total and complete destruction of every civil right you ever had under the Constitution. Wizards at Work: Brain Implants - With the advent of the implantable biochip, the L.U.C.I.D. cybersystem could quickly become the “inner pathway” to total, human enslavement by Big Brother's mind control police. In Microwave News, Craig McCaw, whose McCaw Communications Corporation is a cellular phone giant, is quoted as suggesting that the FCC actually reserves radio wave spectrum for implants the same way the agency does for radio, TV, and cable signals. Since McCaw's corporate empire has now been bought up and merged into the AT&T colossus, Mr. McCaw's comments cannot be passed off as science fiction. The communication wizards are hard at work developing this capability. Andrew Kuper, in his Fortune magazine article, “AT&T's $12 Billion Cellular Dream,” gave us this dramatic insight: Craig McCaw is the kind of man who once suggested in all apparent seriousness - as the color drained from the face of a (corporate) PR man in attendance - that the Federal Communications Commission should reserve spectrum for telepathic communications to be made possible by brain implants he thinks will exist some day. Kuper's words, “...brain implants he thinks will exist some day,” beg comment. In fact, unbeknownst to Kuper, Mr. McCaw was not alluding to some future era, decades hence, in a 21st century America. I believe he meant what he said - that the FCC best start the process now for figuring out how to allot frequency spectra for telepathic communications made possible by brain implants currently being tested on live, human guinea pigs. Are brain communication devices and transmitters - biochips - in fact being surgically implanted in human beings? In an earlier chapter, I broached this subject. Adding to that information, I bring your attention to a book by Robert Naeslund now making waves over in Europe. Here is some information sent to me about Naeslund's revealing, new book: Robert Naeslund's book, When the State Rapes, has been drawing a lot of attention around the world. It includes x-ray photographs showing human skulls with a variety of implants. Injectable transmitters are also featured, as well as accounts of elderly people in Naeslund's native Sweden who are getting transmitters injected into their bloodstreams. Naeslund says the transmitters produce radio waves which induce amnesia and weaken the immune system, leaving the elderly vulnerable to disease. “The inhumanity of connecting elderly defenseless people unwittingly to computers has been going on for at least ten years”, Naeslund writes. He says there is plenty of proof of the “advance towards the technocratic society, governed by the new social norms that breed inhumanity...As a natural consequence, covert surveillance systems able to control the neurological activity of the brain have been developed in secret and beyond public awareness”. George Orwell, in 1984, his classic novel of Big Brother and a coming, totalitarian state observed that very few people are awake and alert to the machinations and manipulations of the controllers. Thus, the people, as a whole, fall victim to a colossal conspiracy out of ignorance and because of apathy and denial of reality: The people could be made to accept the most flagrant violations of reality, because they never fully grasped the enormity of what was demanded of them, and were not sufficiently interested in public events to notice what was happening. For more information about Project L.U.C.I.D., please visit http://www.texemarrs.com/.